If you suspect your pet has ingested any of the following plants, call your veterinarian immediately. 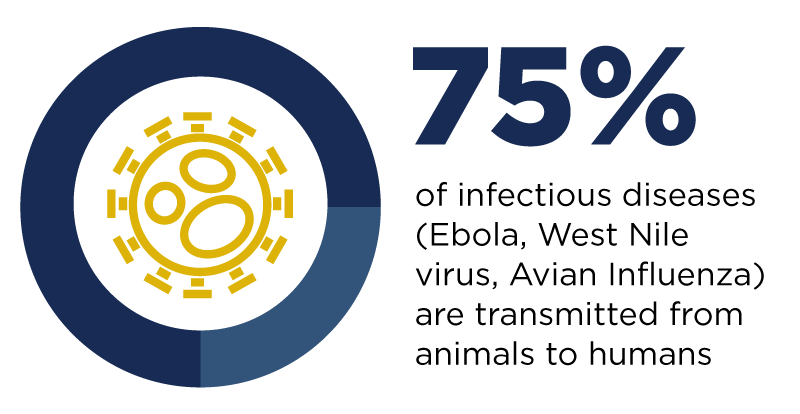 Do not wait to see if symptoms appear because in some cases of poisoning, by the time symptoms appear, it's too late to save the animal. These flowers contain lycorine, a chemical compound that triggers vomiting. Ingestion of the bulb or any part of the plant can cause, in addition to vomiting, diarrhea, abdominal pain, heart rhythm abnormalities and respiratory depression. Allergenic lactones in tulips and similar alkaloids in hyacinths, both chemical compounds, can cause profuse drooling, vomiting and diarrhea — leading to dehydration and additional problems. Larger ingestions (especially of the bulb) can lead to more severe signs, including increased heart rate and changes in respiration. All parts of the plant are toxic, but the lactones and alkaloids are concentrated in the bulbs, so make sure that your dog isn’t digging up the bulbs! Some lilies (Peace, Peruvian and Calla) contain oxalate crystals that cause minor signs of toxicity, and true lilies (Tiger, Day, Asiatic, Easter and Japanese Show lilies) can be fatal. What makes lilies so toxic is unknown, but ingesting any part of the plant can cause complete kidney failure in 36-72 hours. First symptoms appear in a few hours and may include appetite suppression, lethargy and vomiting. Even small ingestions, such as the pollen, can be fatal. 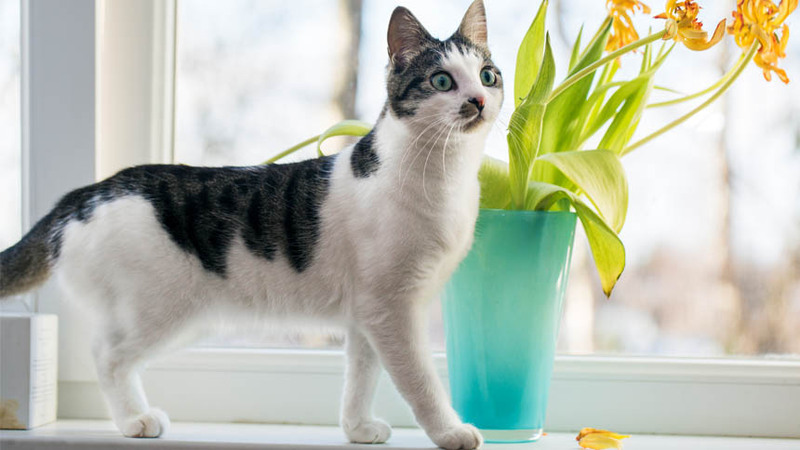 Cats are especially sensitive to lily poisoning, so be very careful to keep your cats away from lilies of any kind, including the Amaryllis, Easter lilies and Stargazer lilies popular around holidays. These plants contain cardiac glycosides, which are sugars that affect how the cardiac muscle contracts. Ingesting any part of the plant can cause vomiting, diarrhea, decreased heart rate, heart rhythm abnormalities and possibly seizures. There are crocus plants that bloom in the spring (Colchicum spp.) and ones that bloom in the fall (Colchicum autumnale). These plants can cause vomiting and diarrhea when ingested. Colchicine and other alkaloids in the Autumn crocus even inhibit cell division and can cause vomiting, gastrointestinal bleeding, liver and kidney damage and respiratory failure. The chemical compounds lactones and pyrethrins as well as other potential irritants in the plant can cause irritation to the gastrointestinal tract and affect the nervous system. Signs of toxicity include vomiting, diarrhea, increased salivation and incoordination. The tubers or rhizomes contain the toxic glycoside cyclanin, a terpenoid saponin which can destroy red blood cells. Ingestion can cause salivation, vomiting, diarrhea, refusal to eat, seizures and heart rhythm abnormalities. Resins called grayanotoxins bind to and modify sodium channels, which allows calcium movement into cells and can lead to vomiting, diarrhea, abdominal pain and refusal to eat. Other possible signs of toxicity include changes in heart rate and blood pressure, weakness, tremors, seizures, paralysis, blurred vision and trouble breathing. The leaves are the most toxic, but all parts of the plant, including trimmings, are toxic. 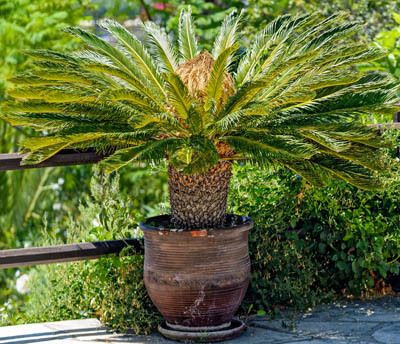 The "Sago palm" is a cycad, not a true palm, and all parts of the plant are poisonous.The plants contain the chemical compounds cycasin and B-methylamino-l-alanine, which are toxic to the nervous system when ingested. Symptoms include vomiting, lethargy, black "tarry" feces, jaundice, increased thirst, hemorrhagic gastritis, bruising, blood clots, liver failure, paralysis and death. Ingestions as small as 1-2 seeds can be fatal. It is recommended that these plants not be kept as potted house plants in homes with pets. A northern California police dog, a patient at one of the UC Davis Companion Animal Memorial Fund donor clinics, died in November 2011 after ingesting parts of this plant. 10. Fertilizers. Although not plants, these deserve mention since they are so often used in gardening. Most fertilizers only cause gastrointestinal irritation when consumed, but there are some products that are more toxic. Blood meal: If ingested this can cause vomiting, diarrhea and severe inflammation of the pancreas due to its high nitrogen content. Some types are also fortified with iron, which can result in iron overload, which is toxic. Bone meal: This is what makes fertilizer so desirable to dogs. When consumed in large amounts, this forms a large bowling ball of cement-like consistency in the stomach that can block the gastrointestinal tract and require surgery to remove. Rose and plant fertilizers: Some of these contain organophosphates, including disulfoton, which can cause buildup of the neurotransmitter acetylcholine that overstimulates certain receptors and is highly toxic to dogs in very small amounts. Ingestion can cause drooling, watery eyes, urination, defecation, seizures, difficulty breathing, hyperthermia and death. Pesticides/insecticides: Most are basic irritants and not a huge concern. However, like rose and plant fertilizers, some may contain organophosphates that cause buildup of the neurotransmitter acetylcholine if ingested, resulting in overstimulation of certain receptors. Iron: This is commonly added to fertilizers and can result in toxic iron overload if ingested. 1. Be aware of toxic risks. Remember, many things that are not desirable to people are readily ingested by dogs and cats. Learn to identify problematic plants and symptoms of toxicity. 2. Reduce access to plants. Consider the ability of the animal to jump and dig when making sure toxic substances aren’t accessible. For example, placing a house plant on top of a bookshelf may not be sufficient if there are cats that like to jump up onto high shelves. Covering fertilizer areas with mulch may not be sufficient because dogs can dig and find the fertilizer or bulbs buried beneath. Always err on the side of caution when determining which plants to bring into the house or plant in the yard! You can see some of these toxic plants at the School of Veterinary Medicine’s Toxic Plant Garden on the UC Davis campus. Dr. Eichstadt moved with her husband, dog, and two cats to join UC Davis as a veterinary pharmacist this past August after completing a veterinary pharmacy residency at Purdue University's Veterinary Teaching Hospital.